Continuing our survey of climate and weather visualizations, this week we have a few ways of visualizing El Niño and La Niña, which are two flavors of the El Niño-Southern Oscillation (or ENSO). This is a relevant topic for this winter, because the world is currently experiencing a La Niña episode. To summarize, these animations are showing how ENSO works and how it impacts precipitation in the tropical Pacific. Normally, ocean currents and wind at the surface both bring air and water from east to west, pulling water away from South America. This keeps the coast of Peru and Ecuador cooler and drier than you might expect, because cold water from the south and from deep in the ocean moves in to replace the water being pushed to the west. Meanwhile, Indonesia, Papua New Guinea, and Oceania receive ample rain from the warm currents and warm winds. This hints at a key concept in hydrology and meteorology: air that starts out cold is unlikely to provide much rain, but air that starts out warm and then rises and cools? That’s a rainmaker. During an El Niño event, the winds and ocean currents are weaker, so there’s less pushing of the warm air to the west, and the area where rain occurs drifts to the east. During a La Niña event, the winds and currents are stronger, so there’s more pushing to the west, and the area where rain occurs drifts west. This map shows how sea surface temperatures along the Equator compared to normal for January of 2018. Blue color shows that the sea surface was colder than normal along the Equator — a La Niña event (from NOAA). Data come from a combination of satellites managed by the USA, Japan, and Europe. The last question we might consider is: Does this have any impact on the USA? The answer is: some impact, but it’s indirect. El Niño and La Niña influence the location of the jet streams, narrow regions of strong winds that direct most of our weather in the USA. The jet streams bring rain. The USA is mostly dominated by the polar jet stream, but during El Niño years, the polar jet stream is pushed to the north, and a secondary jet stream develops in the south — often right through Arizona, Texas, and Florida. So the southern tier of the USA tends to be wetter during El Niño events and drier during La Niña events. La Niña events are often some of the coldest in the northern Great Plains of the US and Canada, and El Niño some of the warmest. For Ohio, La Niña events actually end up being a little wetter because the polar jet stream is more often sitting right over us (like it was nearly all of last week!). Note, ENSO has only a weak to moderate influence in much of the USA, but it is part of what shapes our winter weather! Two weeks ago on Climate Monday, I highlighted some different visualizations of sea ice loss in the Arctic. Monitoring the sea ice regime is important for knowing the limits of human navigation, resource extraction, and other activities in the Arctic, but the subsequent decline in land ice has a much broader impact on humans because melting land ice leads to sea level rise. You may have seen time lapses of retreating glaciers before, like this time lapse of Columbia Glacier in Alaska. That is dramatic and provocative, but in the long term, the two most important sources of ice melt are Greenland and Antarctica. Artistic depiction of the GRACE satellites from the NASA Earth Observatory. One of the main ways we monitor the loss of mass from these ice sheets is the GRACE satellites. GRACE (Gravity Recovery and Climate Experiment) is a pair of satellites launched in 2002 that follow each other around the world about 120 km (90 miles) apart. What they actually measure are very slight variations in that distance between them, and this is indirectly but accurately measures the regional gravitational pull of the Earth. The stronger Earth’s gravitational pull, the faster the satellites will orbit. Since they’re 90 miles apart, when the first satellite passes over an area with greater mass (and therefore a stronger gravitational pull), it goes a little faster and the distance between the two satellites expands. Then, when the second one passes over the same spot, it catches back up and shrinks the distance. That variation in distance tells NASA scientists how much mass comprises various regions of the Earth. It can’t detect small changes like constructing a new building or cutting down a stand of trees. 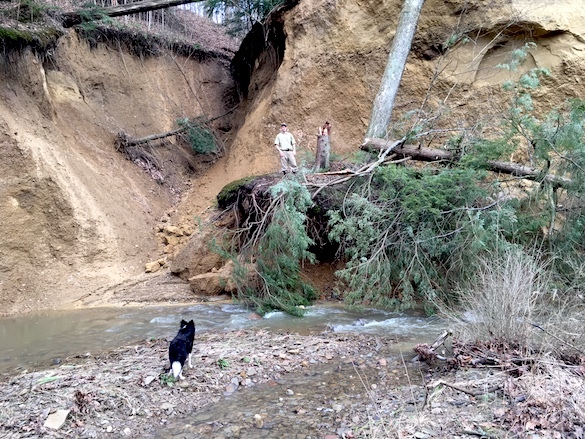 But it can detect large changes like long-term groundwater withdrawal or melting ice sheets. NASA has put together two animations that show this system at work in Greenland and Antarctica. The beauty of these animations is that they pair a time series of mass loss with a map of the decline in the height of the ice sheet. (Be careful; the change in “height” of the ice sheet is measure in “water equivalent”, which means they’re reporting the loss as liquid water, not ice. This is done because the density of water is less variable than the density of ice. Using water makes it easier to compare different areas.) In Greenland, you can see the seasonal cycle of accumulation in winter and melt in summer, but the overall decline is also obvious. Most of the ice sheet has lost mass, but the greatest loss has been at a few really large glacial outlets. Overall, there’s about 0.8 mm (0.03 inches) per year of sea level rise coming from Greenland right now. That’s not huge, but combined with mountain glaciers, Antarctica, and thermal expansion, it’s been around 3 mm (0.12 inches) each year overall since GRACE was launched. Although not very important right now, Antarctica is the most important mass of ice for the long haul. If the entire Antarctic ice sheet melted, it would add roughly 9 times as much water to the oceans as Greenland would (roughly 60 m versus 7 m, respectively). That isn’t going to happen under current projections — but by 2100 we could very well see a meter. The animation starts in 2002 and shows how much mass loss occurred through 2016. The average loss is 125 gigatons per year, which sounds like a lot. It is, to be sure, but it’s only a small amount of sea level rise — about 0.35 mm (0.014 inches) per year. So right now, Greenland is still the bigger contributor. The really cool thing about the animation is that you can see that current mass loss from Antarctica is restricted to just a few places. The Antarctica Peninsula is one place, which makes sense; it’s the farthest north and warmest area of Antarctica. But another is in “West Antarctica” (on the left of the map). This area is losing mass fast, especially Thwaites Glacier and Pine Island Glacier. But overall, Antarctica is contributing only very a small about of melt to the oceans compared to its potential. Although we often care more about the temperature and precipitation when we talk about weather, the most basic weather observation we can make is atmospheric pressure. Atmospheric pressure is really a measure of how much air is above you. That might not seem like a big deal, but clear skies are characterized by high pressure (e.g., 1020 hectopascals, or hPa) whereas storms are characterized by low pressure (e.g., 980 hPa). So air pressure was an early method of short-term weather prediction. If the pressure is dropping, a storm will likely follow. And once the pressure starts rising again, the worst is likely over. That’s useful. What’s also useful is that air pressure is easy to measure. Evangelista Torricelli made a functional mercury barometer back in the 1600s. Today, air pressure is still one of the basic variables used to characterize weather and make forecasts. The surface pressure network as of January 1851 (beginning of the animation). Today’s climate visualization is 160 years of weather observations by Philip Brohan. 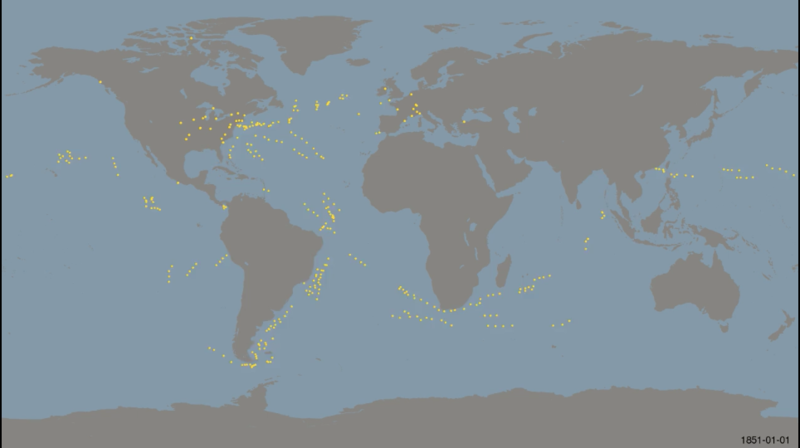 It’s a gargantuan 13-minute animation of all surface pressure observations dating back to 1851 that are currently freely available to the scientific community. Every frame shows all measurements for a 3-day period. That is precise! And some of the patterns are fascinating. At the beginning of the record, most of the data are from ship observations. The only land stations are in North America and Europe, and even those are limited. Throughout the late 1800s, the USA, Europe, Russia, and Australia all see increasing coverage. At sea, changes in ship technology is apparent, as individual ships make a greater range of observations as time progresses. The opening of the Suez and Panama Canals is also obvious. Several countries show abrupt increases in the density of their pressure networks. Japan suddenly has ample coverage in 1901; Germany increases density in the 1930s that far exceeds France. During WWII, India suddenly has a broad network, and Germany’s network reaches a peak in coverage that suddenly drops after the war. eastern China’s network becomes large in the 1950s, falls back in the 1960s, and then stays dense for good in the 1970s. Finally, the breakup of the USSR in 1991 was accompanied by a major decrease in surface pressure observations. 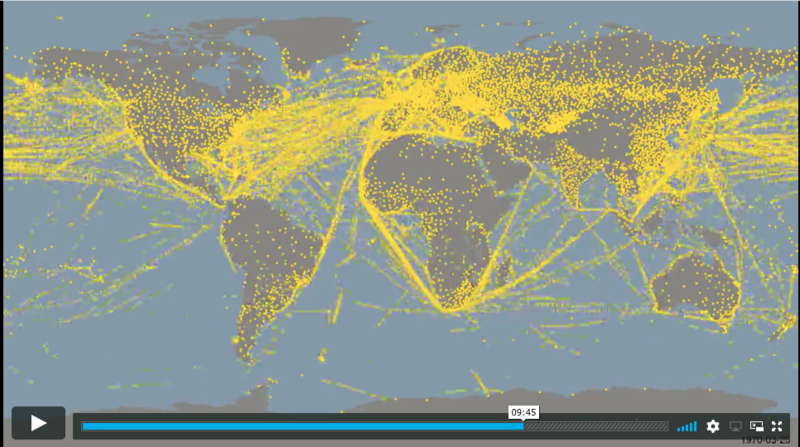 I have not dug too deep into the history of these observations, but this animation is a good window into how human technology and society can impact the availability of scientific data. We are still reliant on shipping lanes to this day for pressure observations, and we know more about the North Atlantic than the South Pacific. For more information about the data source, check out Internatonal Surface Pressure Databank. The surface pressure network as of March 1970 (9:45 in the animation). During the Spring 2018 semester, Monday is Climate Day. To make it even more thematic, I’m focusing on various ways of visualizing climate and weather data. Today’s topic: the long-term decline of Arctic sea ice since 1979. Scientists have long known that global warming would cascade throughout the Earth’s climate system and lead to many indirect effects of carbon dioxide accumulation in the atmosphere. However, the rapid decline in the Arctic’s sea ice cover was one of the earlier indications that climate change was not just in our future, but also our present. The classic way to present this decline is with two figures: a map and a graph (Figure 1). Why September? 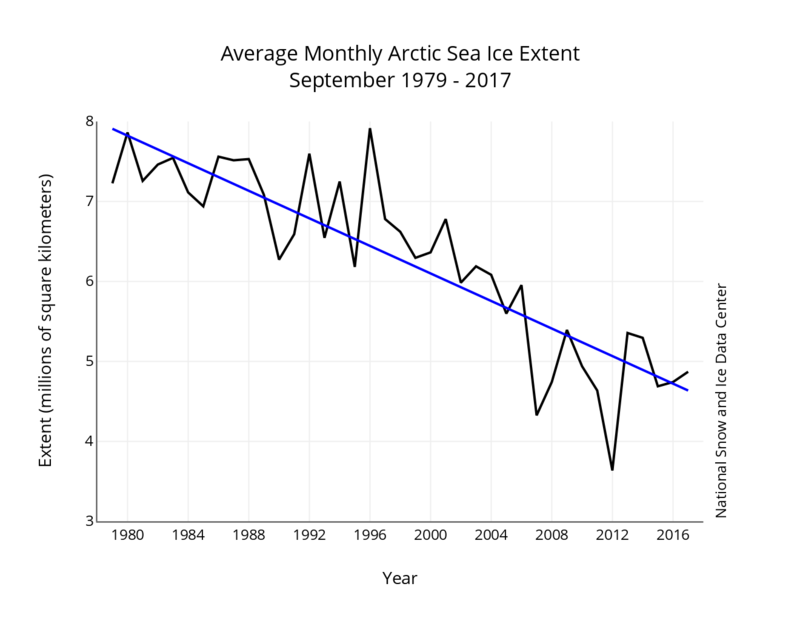 September is the month that Arctic sea ice reaches its minimum extent. Each winter, sea ice expands out of the Arctic Ocean into lower latitudes like Hudson Bay and the Bering Sea. Each summer, it retreats back to the central Arctic Ocean. September is the end of summer, so any sea ice leftover at that minimum is part of the “perennial” or “permanent” sea ice cover. The rest is just temporary. These two plots are helpful scientific tools. For instance, you can see in the map that on average from 1981-2010, there was no open water passage through the Arctic. In 2017 it was possible to send any sea-worthy vessel through. On the graph, you can see how in the year 1996, there still was no clear climate change signal. But 20 years of decline later, the trend is obvious. 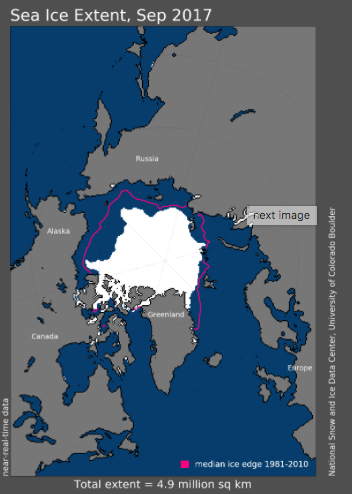 However, this version of showing sea ice can be hard to wrap your head around in terms of scale. How big is 8 million square kilometers anyway? This is where Option #2 comes in. In the Figure 2 on the left, white states are equal to the area of sea ice that existed in both 1980 and 2012. 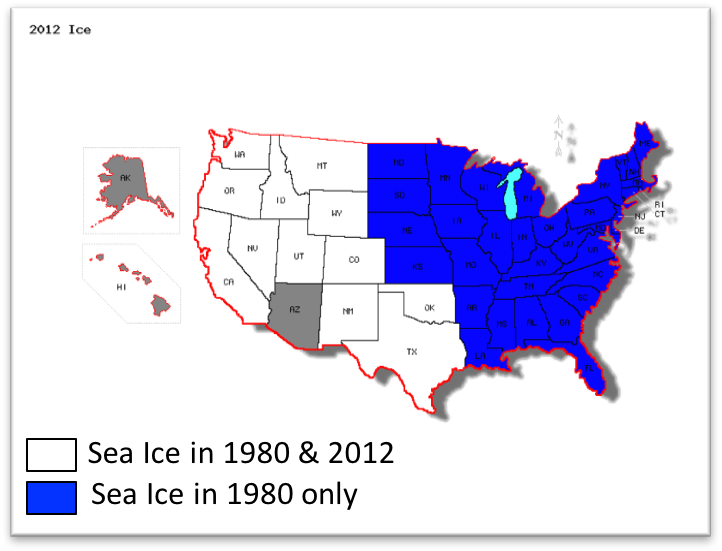 Blue states are equal to the area that had sea ice in 1980 but not in 2012. In other words, blue states are equal in area to the sea ice loss between 1980 and 2012. This figure, by Dr. Walt Meier, helps put sea ice loss into perspective, because that’s not just an analogy; those areas of the states are equivalent to the areas of summer sea ice. So it’s not only that there’s been more than a 50% reduction; a vast area of ocean half the size of the lower 48 used to be covered with ice year-round, but now is seasonally open. But this still isn’t very flashy, so some people have gone the route of animation. Option #3 is animating the maps of Arctic sea ice extent that come from the National Snow and Ice Data Center (Figure 1). This maintains the basic science data approach of Option #1 but adds the animated aspect to help your eyes compare the shape of sea ice extent, not just a dot on a graph. Of course, it can be hard to tell precisely how much sea ice there is in a given year, so this is solely a communication tool, not a research tool. A more recent type of animation that has become especially popular on Twitter is the “death spiral”. Now we are fully in the “communication” realm because the title assigned to this flavor of animation is using charged language. I personally find the term “death” here excessive. However, putting the alarmism aside, the animation can be informative. Around the edge is every month of the year. The sea ice volume (from the Pan-Arctic Ice Ocean Modeling and Assimilation System, or PIOMAS) is 0 cubic kilometers at the center and 35 million cubic kilometers at the edge. Having the Arctic map in the background is superfluous and possibly distracting, but this is the most recent version of the style I could find. This animation does a decent job of showing both a) the seasonal cycle of sea ice growth in winter and melt in summer and b) the long-term trend of declining sea ice volume. Note, though, that this is a bit different from measuring sea ice extent. Sea ice extent is a 2-D measure of the surface area of sea ice in the Arctic. Sea ice volume is 3-D; it’s the area times the thickness of sea ice. Thickness is harder to measure than extent, and PIOMAS assimilates model output with a combination of observations from aerial and satellite remote sensing instruments. Although less confidence can be placed in the precision of the numbers, this metric tells the same story as sea ice extent. I’d love to hear opinions about which type of presentation you like the best!